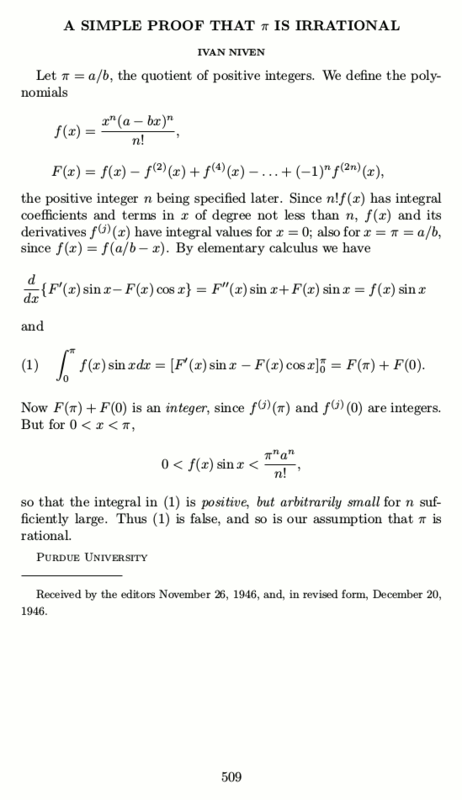 Reading about the history of mathematical typesetting before TeX, I found an interesting article from Ivan Niven titled: "A SIMPLE PROOF THAT π IS IRRATIONAL" which is dated back to 1946 when there was no TeX (and probably no computer at all). The typesetting was great, and I was wondering if this is an originally typeset paper from 1946, or a new remake? If this is from the old days, how they could achieve such a nice output? 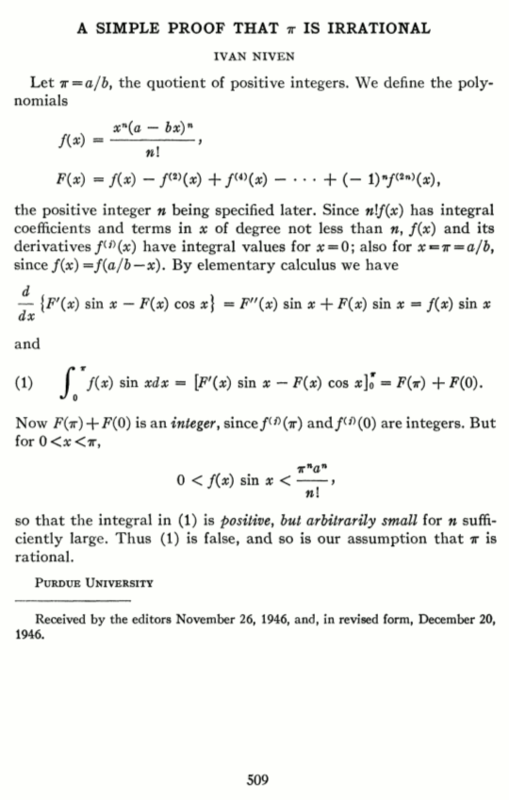 The digitization and unrestricted availablity of the backfile of the Bulletin of the American Mathematical Society (1891-1991) is made possible with the generous support of the Gordon and Betty Moore Foundation, the Mathematical Sciences Research Institute, and the American Mathematical Society. in 1947, the ams bulletin was typeset by the george banta printing company, menasha, wisconsin. they were one of a handful of compositors specializing in technical composition of very high quality. they would have used monotype machines, that being the only system in existence at that time that was capable of such work with relatively little additional handwork. the cited article, available from project euclid, is a scan from the original. although the font is very similar to computer modern (in fact, it may very well be the font on which computer modern is based -- monotype modern 8a), there are characteristics that will positively identify it as not tex output. both the shape and the spacing are different.